Tofino, BC is one of the most beautiful places on earth, and that's not the only reason to visit! 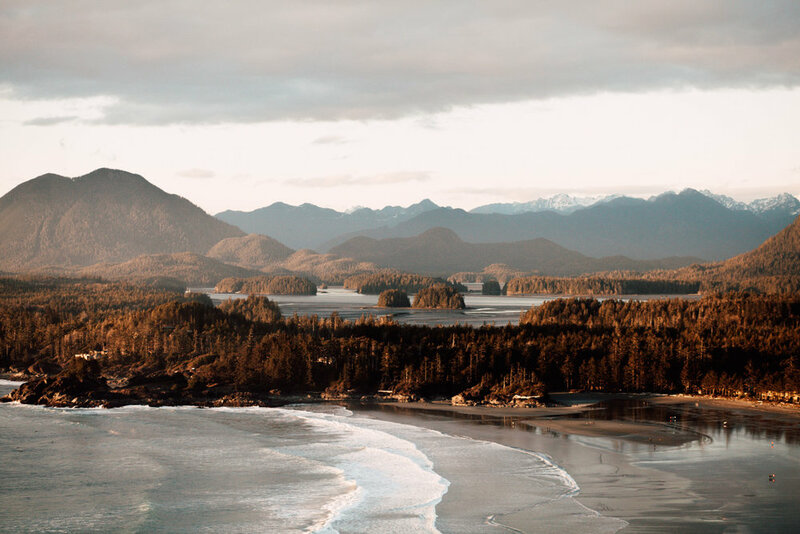 Besides being one of the only places in Canada you can surf, Tofino also has stunning sandy beaches, an incredible food scene full of local, fresh seafood, and beautiful resorts made for relaxing. One of the things that makes Tofino, BC such a magical place to visit is that it's pretty secluded. While the trip is definitely worth it, is does involve driving to the ferry, taking a 2.5 hour ferry to Nanaimo on BC Ferries, and then driving another ~3 hours. Did we mention that the last bit of the drive is super windy roads, too? If you're like us, the last thing you want to do when leaving or coming home from vacation is deal with renting a car, especially when you already have a long road trip ahead of you. It adds SO much time to your trip to wait for your car and return it, not to mention you get charged if you don't return your car exactly when you thought you would be back. That's why we were SO excited to find out that you can take an Evo Car Share on the road with you outside of the city! 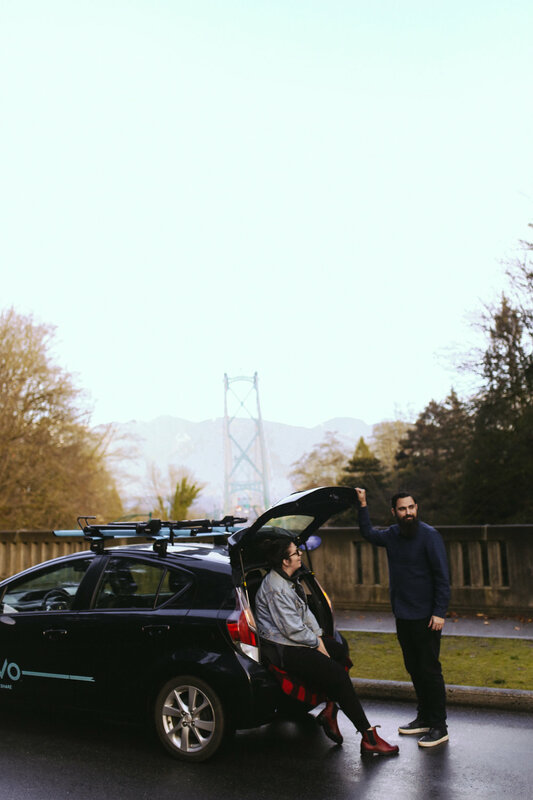 We use Evo all the time in Vancouver anyway, so we decided to use Evo's daily rental rate for our road trip to Tofino. It's $89.99 per day, and that includes all of your gas too! We did the math and compared it to a regular rental car rate, and after you add up the rental fee, insurance, and gas, it was not only cheaper to take Evo, but way more convenient. There was an Evo across the street from our house, and when we came home all we had to do was drive to our house, unload our bags, and sign out. No horrible rental car experience, yay! If you want to try out Evo, use the promo code "JOIN" to get free membership + 30 free minutes! 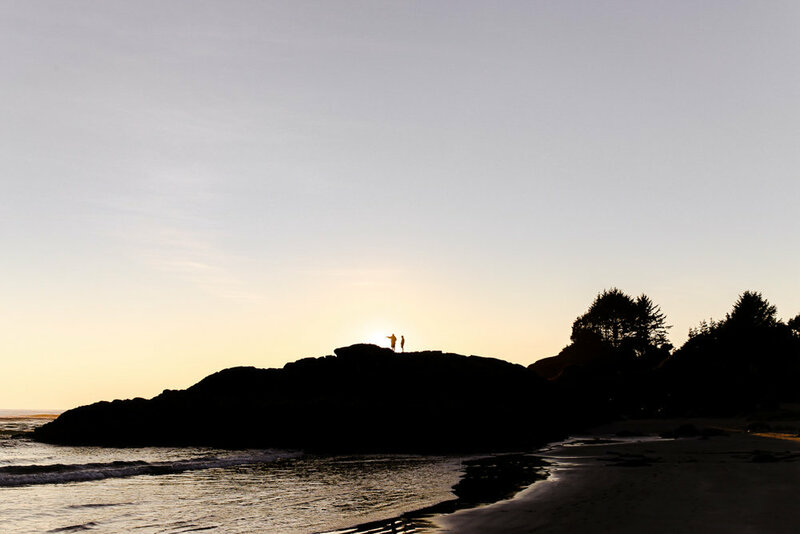 We stayed at the most incredible and romantic Tofino resort! 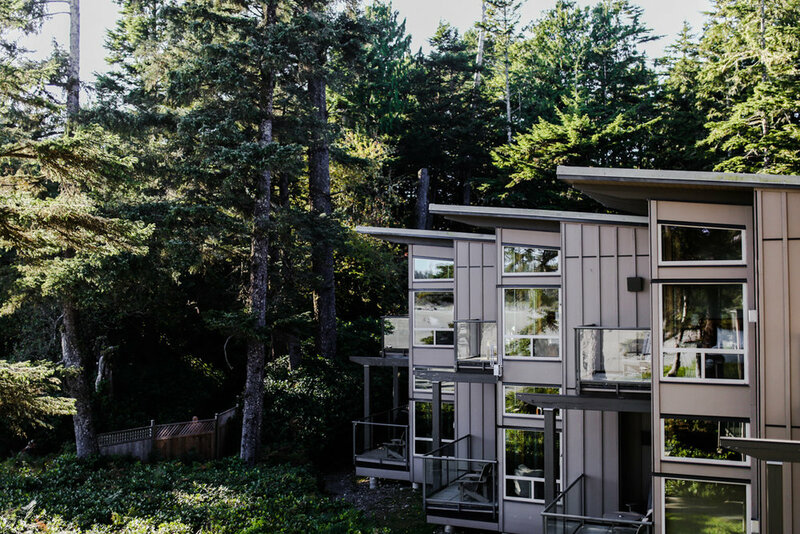 We quickly fell in love with Pacific Sands Resort, and we had an amazing beach house to enjoy all to ourselves. All of the beach houses have this incredible, floor to ceiling view from the master bedroom, complete with your own balcony that is literally right on the ocean. The view from our room was pretty incredible, there were steps to the sand right beside our beach house and we had incredible ocean views. Nothing like falling asleep to ocean waves every night! 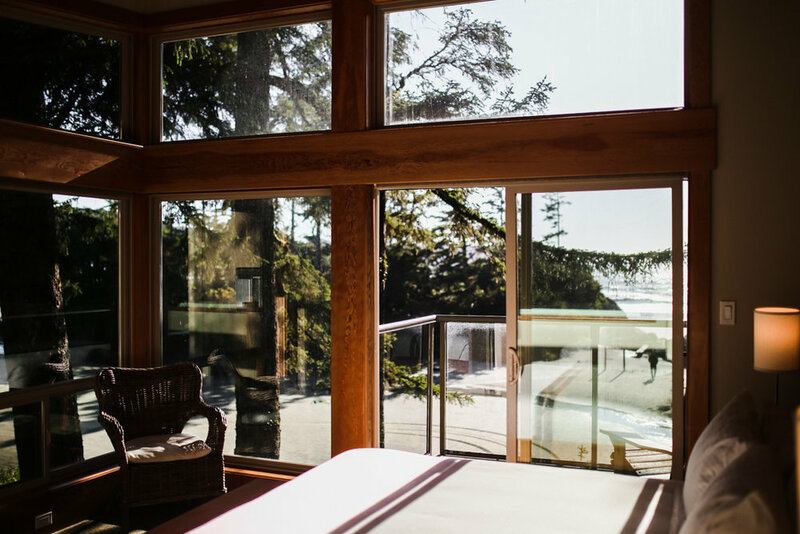 The beach house had a full living room, kitchen, and second bedroom, so this would be the perfect Tofino resort for a group of friends or a family too. 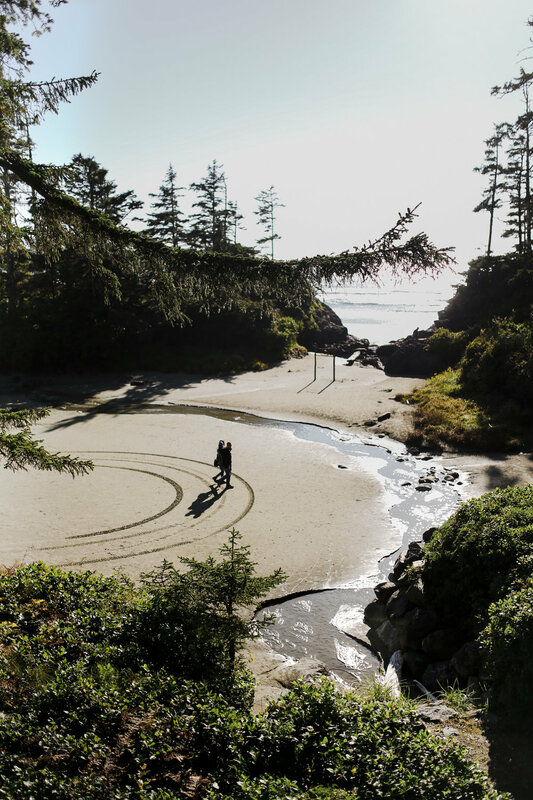 Pacific Sands Resort is located right on the beach in Tofino at Cox Bay. This is a popular spot for surfers, and it's honestly one of the prettiest beaches we have ever been to. It has long, sandy beaches (something you don't get in Vancouver) and Pacific Sands Resort has their own private trails that are perfect for going on a walk at sunset. Having the beach literally right outside your front door is such a luxury, and it's such a calming escape from the city. 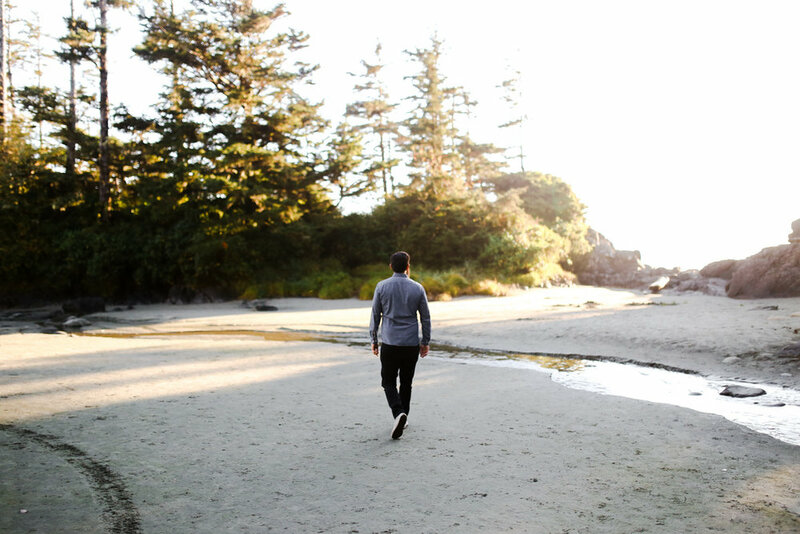 Perhaps that's why Tofino is such a special place for so many people, they get the chance to just exist in beautiful nature and don't have to worry about anything other than when their next beach walk will be. Like we mentioned, Cox Bay is a popular Tofino surfing spot. One of the best benefits of staying at Pacific Sands Resort is that they have one of the best Tofino surfing schools located on the resort! 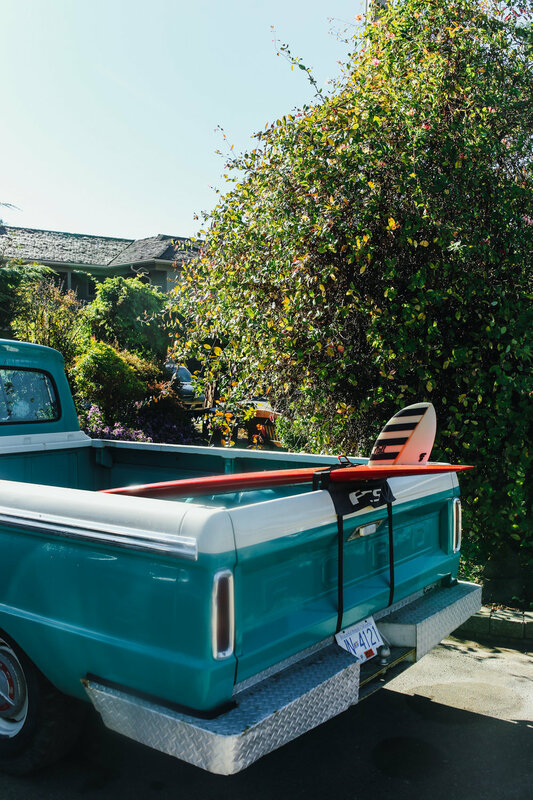 Surf Sisters is a Tofino staple, and their surf shack at the resort makes it super convenient for you to go surfing whenever you want (or every day). We had never surfed before, and while I was a little nervous to try, we ended up having so much fun! The instructors at Surf Sisters are all women, and they make surfing super accessible and not intimidating at all. They provided us with everything we needed: wet suits, booties, surfboards, and the confidence to get up on a board and catch a wave! Plus, with Wildside Grill restaurant right next door to Surf Sisters at Pacific Sands Resort, you'll have some amazing seafood to fill up on after you've burned all those calories surfing! Wondering where to eat in Tofino? 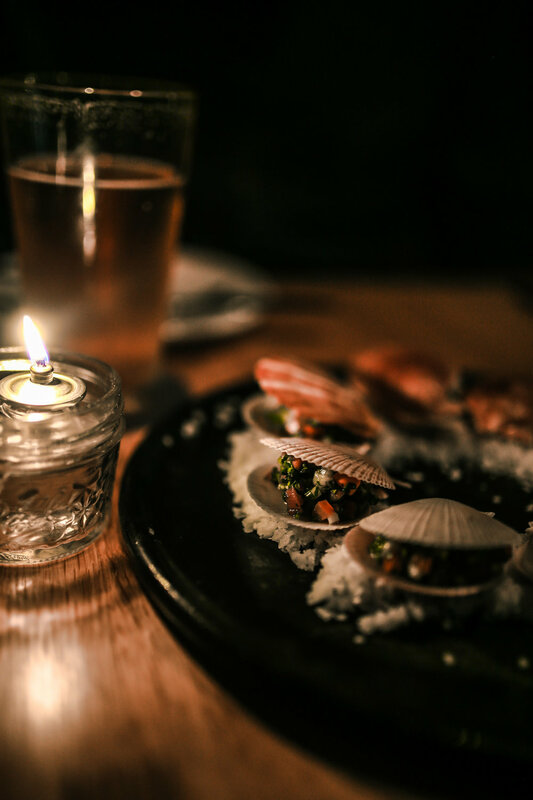 Well you're in luck, because the restaurant scene in Tofino is amazing! Between the Wolf in the Fog, Wildside Grill, Shelter, Tacofino, and Rhino donuts, there's so many yummy things to eat. On this trip, we tried out the new 1909 Kitchen at Tofino Resort and Marina, and it was amazing! 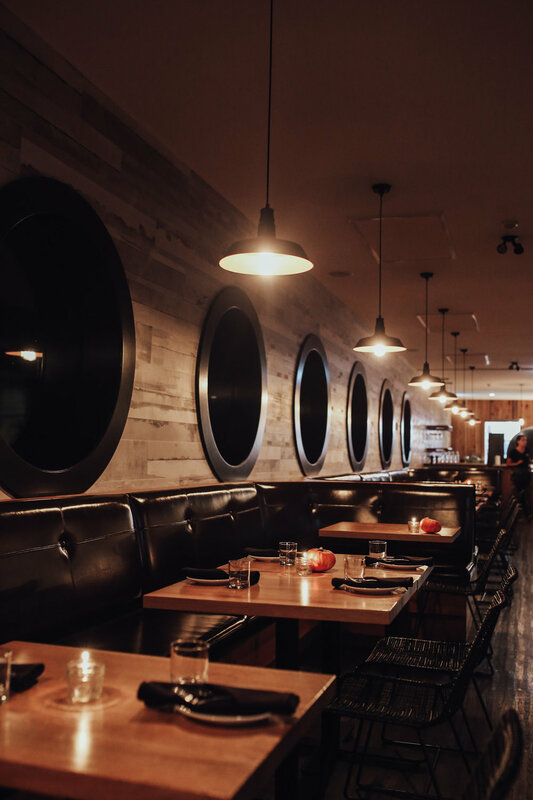 This new Tofino restaurant is not only stunning and newly renovated, it's located right on the marina so you have a beautiful ocean view during dinner! Their menu is seafood oriented to showcase the best of Tofino, and their wood-burning oven cooks up some seriously delicious pizzas. Chef Paul Moran created this amazing shared plate of ceviche in shells, and we sipped on their delicious cocktails all night long. 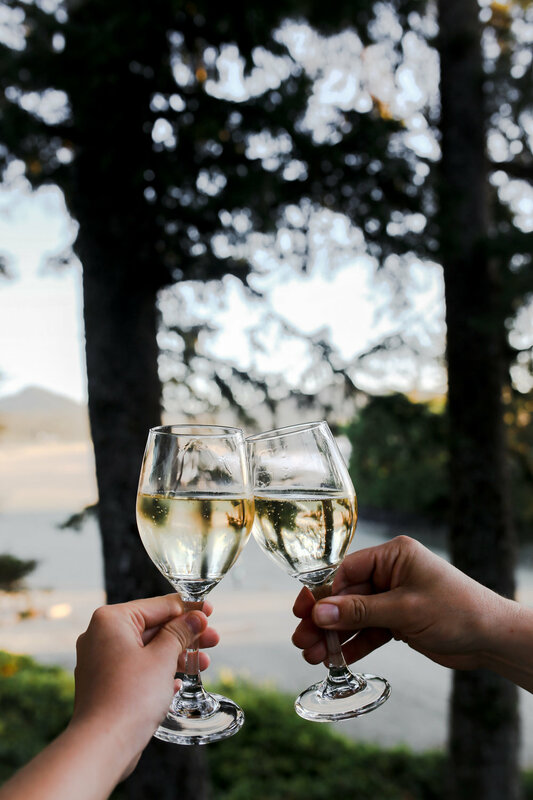 Definitely make a reservation at 1909 Kitchen for your Tofino trip! It's our new favourite. Obviously, one of the things you have to do when you visit Tofino is hit up Tofino Brewing! Whether you sit and stay for awhile in their tasting room, or grab a growler to go, Tofino Brewing is a classic part of any visit. Their kelp stout is so good too, it's literally made with kelp from the ocean and has a yummy chocolate-y taste to it. Pretty unique! Tofino is such a naturally beautiful and inspiring place to visit, you're guaranteed to have a great time! We can't say enough good things about it, especially our stay at Pacific Sands Resort. Looking for more BC road trips? Check out 7 Gorgeous Weekend Getaways from Vancouver !